My first few days with the Nest v2 is similar to most Nest owners: I adore it. The look and feel matches the high quality of Nest v1 while setup and most product features are exactly the same (at this time both versions share the same software versions and updates). Compared to the first version, Nest v2 is slimmer and provides ten connectors (instead of 8) to be compatible with a wider range of HVAC systems. Both versions include Zigbee hardware though this common digital meter connectivity feature is not yet being used by Nest. The free Android app works perfectly (for my particular phone, at least) and mirrors the realtime monitoring, remote control and reporting features of the iPhone version. Nest v2 is "price fixed" at $249 everywhere it's sold but I was fortunate enough to get one for $224 by taking advantage of a general "$25 off $250" promotion at Lowe's... once I added two rolls of paper towels to reach the $250 mark, that is. You may find some brand new v1 units discounted to under $200 but most of those now appear to be sold out. A number of utilities also offer rebates to Nest owners. 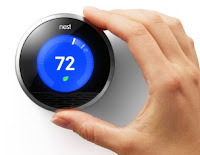 Austin Energy offers an $85 rebate per Nest (restrictions apply). Check for rebates in your area by entering your zipcode here. As noted in my previous post, version 3.0 of the Nest software was accompanied by version 3.0 of the Android app which delivered better support for larger displays. Check! Although Nest provides a browser-based UI for accessing your account you still are not allowed to use the browser option with an Android device -- it's the native Android app or nothing. Fail. Nest's "Auto-Schedule" and "Auto-Away" features are the core "smart" features of this smart device. The features work well for most people but not all. A potential fix could involve features suggested by other Nest owers: add an optional remote proximity sensor and/or a remote temperature sensor. Every home and and every family's pattern of activity is different -- for our Nest we'll just have to wait and see how the learning features fare in our particular environment. This was my #1 "I can't believe it's not there" feature: if the Nest knows you're "away" and detects movement, there should be an option for it to alert you (email, SMS, etc). Recently I described the Nest's sensor and connectivity capabilities to my father and his very first question was "does it tell you when it detects something while you're gone?" Despite this, most people don't seem to share the desire the ability to have Nest act as a silent, limited range motion alarm -- currently there very few votes for such a feature on the "product suggestions" list. Nest now has an option named "Early On" that "starts cooling early to reach the temperature at the scheduled time." Exactly what I was on about last October. Check! Nest's smartphone apps are not location aware -- they won't tell your Nest if you're unexpectedly away (such as on vacation) or perhaps are en route to arrive home at an odd time. A few months after my short rant on this missing feature it was suggested by a member of the Nest community and is now the 7th most-requested Nest feature. This is perhaps the most perplexing "missing feature" of them all: the Nest does not allow calibration of its temperature sensor. If your sensor's baseline is a bit too high or low (abnormally warm/cold Nest location or an out-of-spec sensor) there is nothing you can do about it except adjust your target temperatures accordingly. Unfortunately such adjustments can easily negate the usefulness of "green leaf" reporting features that are based in large part on your temperature settings. Nest should allow the option to adjust your baseline to compensate for any oddities. Five months after my post this feature was recommeneded by another Nest owner (although it's still low on the list as the #32 most requested feature). Many of the items I linked to are suggestions that have been made by other Nest owners on the "Product Suggestions" board. The suggestion board is hardly a new concept but it's great to see the Nest team providing such a public means for users to come together and agree (via voting) on what most needs attention. I'm looking forward to reporting my Nest v2 experiences as the Nest team pushed out new features. I'm admittedly a lot more excited than a person should be about a thermostat -- if Nest begins offering add-on accessories I may just resort to modifing my birthday and Christmas wish lists.